We are VERY excited about our upcoming Fall Book Fair. An amazing selection of books is headed our way! Mark your calendar and join in the fun!!! It is a great opportunity for students to find books that really interest them. We know kids read more books when they get to choose their own. The more kids read, the more their reading skills improve. Don't miss the chance to light up a young reader's face with a good book! Shop for books for your entire family. Create a wish list to bring with you to the Book Fair. Purchase books from the Classroom Wish List for your child's classroom. Purchase books for your child's teachers. 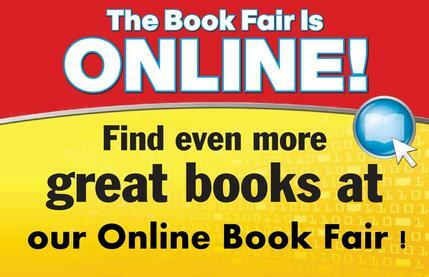 ​You can begin your book shopping at the McCall Online Book Fair in the comfort of your home! Visit the McCall Book Fair home page and click on the Shop Now button. The Online Book Fair allow families and friends across the nation to participate, and makes it convenient for parents who are not able to attend the Book Fair in person, or who want to browse an expanded title selection. Best of all, every purchase benefits our school and will help us achieve our Book Fair goal. All online orders ship for FREE to the school after the Online Fair has ended. Don’t forget add a book or two to your order for your child's classroom libraries. So get a jump start on your Book Fair shopping, and thanks for supporting our school! The book fair is an exciting celebration of reading with hundreds of fun, engaging and affordable books for kids to discover. Join our volunteer team to assist with set up, help shoppers of all ages find the perfect book during the fair or help pack up once the fair has ended. As a token of our appreciation, all volunteers will receive 10% off their orders!